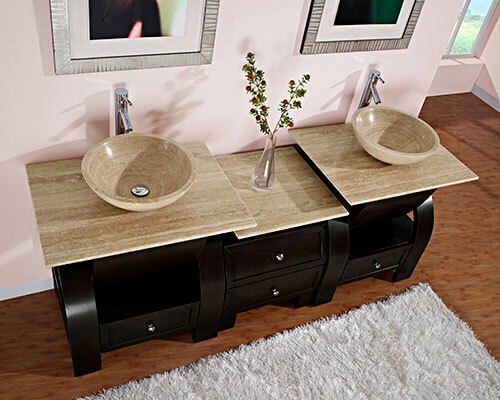 The 77" Cali Double Vessel Sink Vanity brings beauty to every bathroom it's put into. With its contemporary style and gorgeous Espresso finish, the Cali makes the perfect focal point. Its top is made from Roman Vein-Cut Travertine and is matched with two Travertine vessel sinks. In between each sink is a detachable drawer bank that provides two more drawers, on top of the two single drawers underneath each sink. Faucets are not included.